The brazed plate evaporator is made of stamped stainless steel plates, furnace brazed together with copper based joints. The complex geometry of the flow passages promotes turbulent flow which gives high efficiency and reduces fouling by mineral deposits. Large solids (plastic pellets, chunks of mineral deposits etc.) will collect at the water inlet port or the evaporator and restrict flow through some of the passages. If this possibility exists, the factory recommends filters or strainers to installed in the from process line. If the evaporator becomes fouled there are several methods for cleaning the evaporator. If there are mineral deposits adhered to the plates, the evaporator must be backflushed with a mild acid solution (5% phosphoric, or5% oxalic acid is recommended. Please note : This procedure is not normal maintenance. Maintaining proper water qualitly and filtration will minimize the need to backflush the evaporator. Turn off all power to the machine. 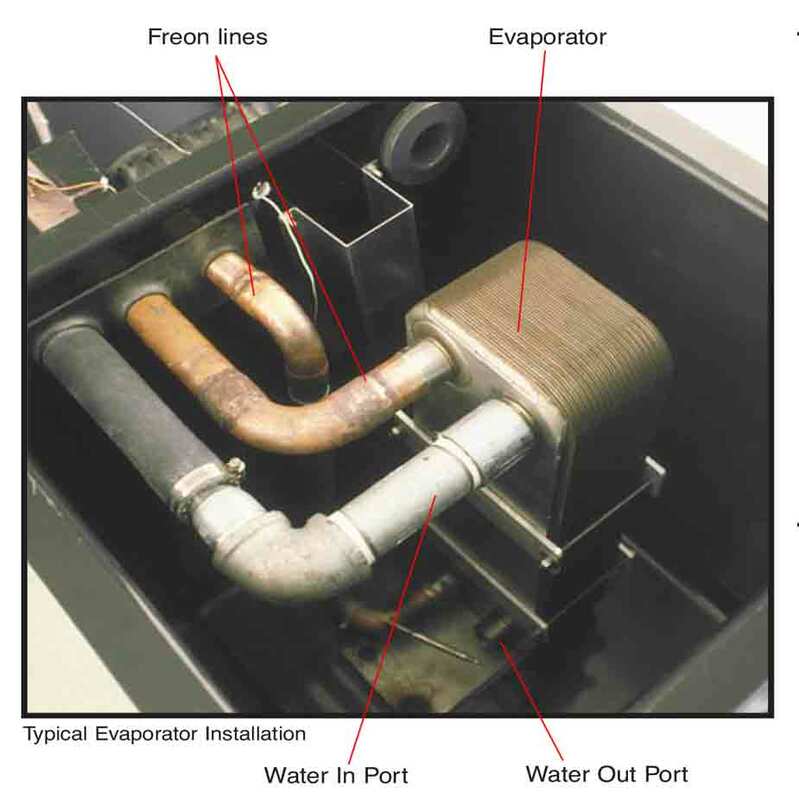 For water chillers with a reservoir tank, drain tank to below the evaporator outlet. For water chillers without a reservoir tank, drain total unit. Remove the piping to the water in port at the evaporator, if there are solids at the inlet remove them. Connect a water supply hose to the evaporator water outlet. If acid cleaning, connect the discharge hose from the acid pump to the evaporator outlet port. 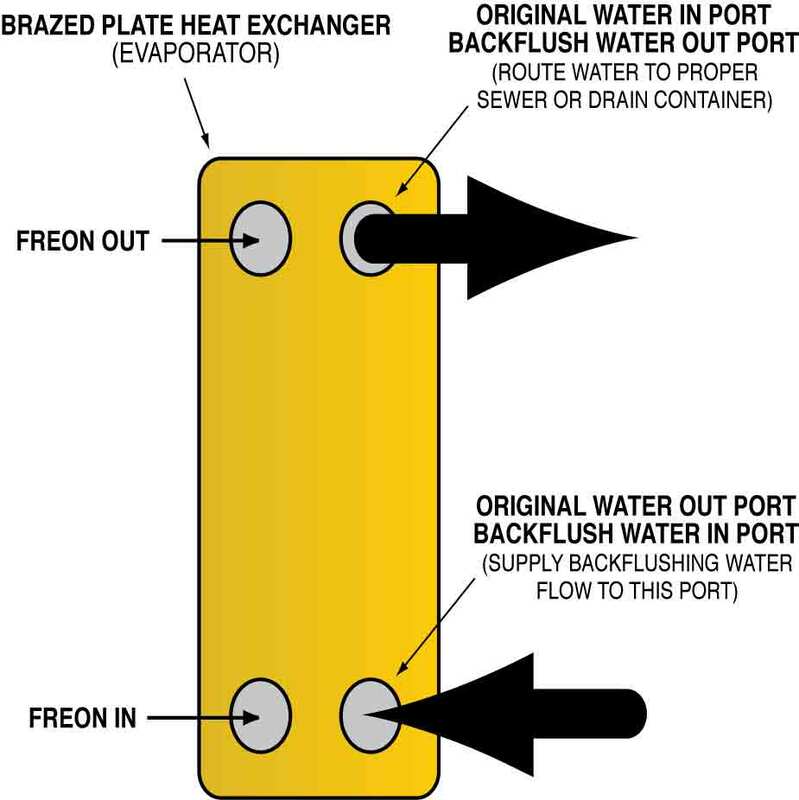 Connect a hose to the evaporator water supply port and to an appropriate containment vessel. If acid cleaning, connect the evaporator water inlet port to an acid solution reservoir tank. Dispose of all backflush water according to local codes. Your water supply source should have at least 20 psi available. If acid cleaning, follow the instructions supplied with the acid solution carefully. After cleaning, rinse with clear water before returning to service. Once finished, reinstall all water line to original factory orientation. Restart the unit and check for proper operation. For more information about cleaning and backflushing the brazed plate evaporator call the Advantage Service Department at 317-887-0729. Would you like to Download FYI #149 to your browser?